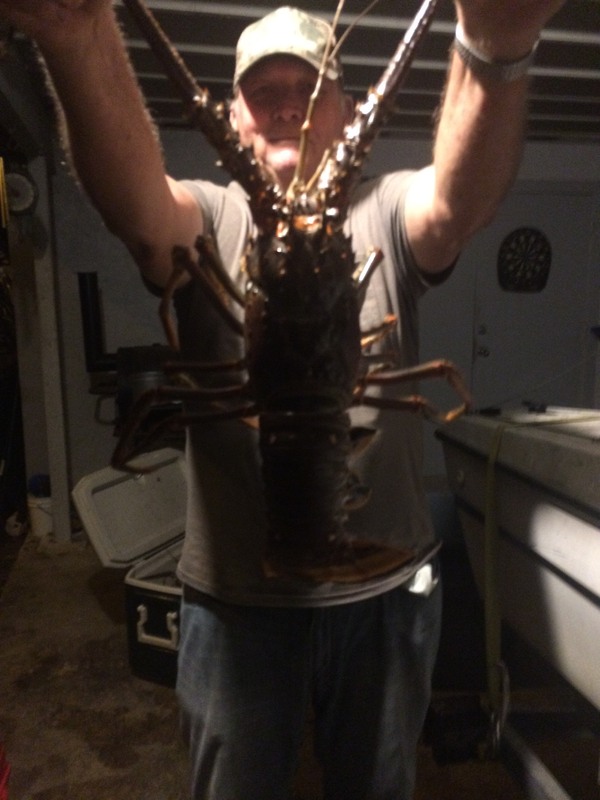 With the 2018 spiny lobster season open, I thought it would be helpful to discuss and gather a few tips on catching florida lobster. Best lobster this year. Caught by my longtime friend and commercial fisherman Gary B of Homestead Florida . Bullynetting is the fun way! Dive gear - A good dive mask, snorkel and fins, for those who choose to snorkel. A couple of dive tanks, bc, weight belt and other essential scuba equipment for those who are certified for scuba diving. Tickle stick - a 3 ft fiberglass stick for coaxing lobster out of a hole. measuring tool - used to check size of the lobster. Simply place the tool between the horns on its head and the back of its shell where the tail meets and must extend beyond the tool. Over the years, I have gone after lobster in many different ways. Scuba is one of the best for daytime lobstering because you have less competition from other divers. The only downside is you have to dive on a spot where you don't know there are lobster, which is the hard part. Another choice is to drag behind a boat with other divers in your group. This is usually done in much shallower water and is done by snorkeling. We will cover two to three miles of coastline using this method. You just troll behind the boat, looking for something worth checking out on the bottom. This could be a hole full of lobster, a grouper or hog snapper sitting next to a sea fan. This does require a person to remain in the boat who constantly monitors the divers and notices when one is dropped from the tow ropes. Another choice for going after florida lobster is by not getting in the water. Bully Net - a 12ft pole net where the net ring is bent at a 90 degree angle to the pole. Poles are generally custom made using an aluminum pole, stainless steel rod for the ring, and a shrimp net or other mesh type net which are available at most bait and tackle shops. I can make one for you for about $50.00, just send me an email to: sales@marinesurveysplus.com . Night Lights - The only lights worth having are custom made. I use and make two sets every year. I use three 500 watt halogen bulbs on replacable end caps with glare sheilds and weed guards. These lights will light up the water in a twenty foot radius around the boat, allowing you to see the lobster faster and clearer, even on nights when the water conditions are not perfect. I can custom make a set for you. Just send me the depth to the waterline where you will place the mounting hardware. Cost of each light is $130.00. Generator - I use a Honda 2000 watt model. It is quite, powerful and runs all night without needing to be refueled. GFI extension cord - I use a waterproof outdoor electrical box on the end of a 12 guage extension cord with a GFI interuptor receptacle inside. Your working with a lot of electricity and a lot of water, you need to protect against electrical shock. Lobster measuring tool - You still have to make sure they are of legal size. Shallow draft boat - To catch lobster, you must be able to get to where you can find them. Bully betting is done on the shallow flats on either side of an outlet to the ocean. The lobster emerge from the deeper water of the channel onto the flats in search of food every night. You need to be able to run your boat in really shallow water. We use boats which we have built ourselves for this exact purpose. The best way to learn how to bullynet is to take your boat and gear to one of the oceanside cuts which have sand bars on either side of the channel. About an hour after dark the lobster will begin to move up onto the flats. With your lights mounted on the bow of the boat, idle around looking for a whitish object on the bottom. As you manuever the boat towards the lobster, take your net, with the pole between you and the face of the net ring. Lobster will try to escape away from you as you attempt to net them, so try to bump them with the pole end of the ring, causing them to jump up and away from you and into the net. We proudly serve boaters from the Palm Beaches to the Florida Keys. General information on proper Marine electrical wiring. How you can prolong the life of your marine engines. Fuel additives and marine fuel filters . How often should i need boat service. What can i use to paint and restore my boat . Boat parts are boat parts right? General upkeep for your boat. Are you an avid fisherman ? Tell us your stories.